Innovation Begins Here | Innovation distinguishes between a leader and a follower.If you want become a leader just follow us. 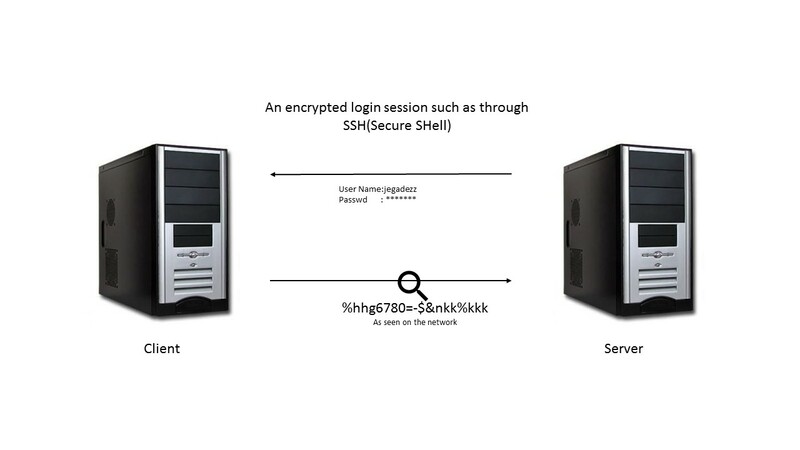 This article covers the SSH client on the Linux Operating System. Note: This article is one of the top tutorials covering SSH on the Internet. It was originally written back in 1999. These two diagrams on the left show how a telnet session can be viewed by anyone on the network by using a sniffing program like Ethereal (now called Wireshark) or tcpdump. It is really rather trivial to do this and so anyone on the network can steal your passwords and other information. The first diagram shows user jegadezz logging in to a remote server through a telnet connection. He types his username jegadezz, which are viewable by anyone who is using the same networks that he is using. Getting SSH installed is really easy, and only takes a few other bits of information to get going. On the computer which you’d like to use to connect to other computers, you’ll need to install the OpenSSH client if it isn’t already. On Ubuntu systems this can be done with sudo apt-get install openssh-client. Once that installation completes, you’re already good to go with one computer. On every computer that you want to connect to, you’ll need to install the server-side part of the software if it isn’t already. You can do so on Ubuntu systems with the command sudo apt-get install openssh-server. Once this is installed, all of the needed software is installed. Lnux on the desktop is making great progress. However, the real beauty of Linux and Unix like operating system lies beneath the surface at the command prompt. ncurses picks his best open source terminal application. ncurses (new curses) is a programming library that provides an API which allows the programmer to write text-based user interfaces in a terminal-independent manner. It is a tool kit for developing “GUI-like” application software that runs under a terminal emulator. It also optimizes screen changes, in order to reduce the latency experienced when using remote shells. cmus is a music player that I admire the most when it comes to command-line because it’s really powerful and has a lot of nice features. It is built with ncurses and therefore providing a text-user interface. cmus is indeed feature-rich, with several view modes and Last.fm song submission support via scripts. Finch comes bundled with Pidgin, the popular IM client. Finch offers the same functionality that Pidgin offers, only that it does it in a terminal by using the ncurses library. It supports IM protocols like Yahoo, Google Talk, XMPP (Facebook), WLM (Windows Live Messenger) . htop is an interactive process viewer tool using ncurses which has the great benefit that it allows to scroll up and down the list of processes, and it also uses graphs and colors. There are plenty of tools available based on ncurses like moc,aview,convert,lynx. Follow Innovation Begins Here on Twitter,Facebook , Google+ & Linkdin. Small satellites could hitch rides to space on an F-15 fighter jet by next year, according to the Defense Advanced Research Projects Agency (DARPA), the agency responsible for developing new technologies for the U.S. military. DARPA’s so-called Airborne Launch Assist Space Access (ALASA) program is an ambitious project that aims to launch small satellites more quickly, and reduce the cost of lofting them into orbit. Traditional launches using rockets cost roughly $30,000 per pound ($66,000 per kilogram), DARPA officials have said. The F-15 jet would take off on a nearly vertical trajectory, with the expendable launch vehicle mounted underneath it. Essentially, the fighter jet acts as the first stage of a rocket, according to DARPA. After the aircraft flies to a high altitude, it releases the satellite and can then return to land on a conventional runway. ALASA flight demonstrations are expected to begin later this year, and the first orbital test launch is slated to occur in the first half of 2016. A dozen other demonstration launches are also planned for next year, according to agency officials, who declined to comment on the ALASA program in an interview with Live Science. “We’ve made good progress so far toward ALASA’s ambitious goal of propelling 100-lb. [45 kg] satellites into low-Earth orbit (LEO) within 24 hours of call-up, all for less than $1 million per launch,” Bradford Tousley, director of DARPA’s tactical technology office, said in a statement. “We’re moving ahead with rigorous testing of new technologies that we hope one day could enable revolutionary satellite launch systems that provide more affordable, routine and reliable access to space,” Tousley said. A public update on the ALASA program took place earlier this month at the Federal Aviation Administration’s 18th annual Commercial Space Transportation Conference in Washington, D.C. The new system is designed to be “an alternative to ride-sharing for satellites,” which is when a small satellite hitches a ride into space on a rocket whose primary purpose is to boost a bigger satellite, according to TechieNews. The system “enables satellite owners to launch payloads from any location, any schedule into orbits of their choice, on a launch vehicle designed specifically for small payloads,” Mitchell Burnside Clapp, DARPA module manager for ALASA, told TechieNews. The system designs were narrowed down to three in the first phase of the project, but the agency is planning more maneuvers to reduce the cost as much as possible. These methods include using conventional runways to launch and land the missions, and developing “a new high-energy monopropellant” that combines rocket fuel and oxidizer into one liquid. Other cost-saving measures for ALASA include mission-planning software to streamline launches, a system to watch over the vehicle using satellites and an automatic flight-termination system that could stop the flight if safety were at risk. In March, Boeing was selected as the prime contractor for the second phase of the ALASA program. This article was originally published on livescience. What Happens When Drones Start Thinking on Their Own? You will be forgiven if you missed the Drones for Good competition held recently in Dubai. Despite drone technology really taking off commercially in the last year or so (the potential puns are endless) they remain a relatively niche interest. Drones – or unmanned aerial vehicles (UAVs) as they are increasingly known – have reached a mass-market tipping point. You can buy them on the high street for the price of a smartphone and, despite a large DIY Drone community, the out-of-the-box versions are pretty extraordinary, fitted with built-in cameras and “follow me” technology, where your drone will follow you as you walk, run, surf, or hang-glide. Their usefulness to professional filmmakers has led to the first New York Drone Film Festival to be held in March 2015. Technologically speaking, drones’ abilities have all manner of real-world applications. Some of the highlights from the US$1m prize for the Drones for Good competition include a drone that delivers a life-ring to those in distress in the water. Swiss company Flyability took the international prize for Gimball, a drone whose innovative design allows it to collide into objects without becoming destabilised or hard-to-control, making it useful in rescue missions in difficult areas. The winner of the national prize was a drone that demonstrates the many emerging uses for drones in conservation. In this case, the Wadi drone can help record and document the diversity of flora and fauna, providing a rapid way to assess changes to the environment. What does this all mean for how we think about drones in society? It wasn’t long ago that the word “drones” was synonymous with death, destruction, and surveillance. Can we expect us all to have our own personal, wearable drone, as the mini-drone Nixie promises? Of course the technology continues to advance within a military context, where drones – not the kind you can pick up, but large, full-scale aircraft – are serious business. There’s even a space drone, NASA’s Boeing X-37, which spent several years in automated orbit, while others are in development to help explore other planets. There’s no escaping the fact that drones, like a lot of technology now in the mainstream, have trickled down from their military origins. There are graffiti drones, drone bands, Star Wars-style drone racing competitions using virtual reality interfaces, and even theatrical drone choreography, or beautiful drone sculptures in the sky. There are a few things about drones that are extremely exciting – and controversial. The autonomous capabilities of drones can be breathtaking – witnessing one just fly off at speed on its own, it feels extremely futuristic. But this is not strictly legal at present due to associated risks. A pilot must always have “line of sight” of the drone and have the capacity to take control. Technically even the latest drones still require a flight path to be pre-programmed, so the drone isn’t really making autonomous decisions yet, although the new DJI Inspire is pretty close. Drone learning has to be the next step in their evolution. Yet this prospect of artificial intelligence raises further concerns of control, if a drone could become intelligent enough to take off, fly and get up to all kinds of mischief, and locate a power source to re-charge, all without human intervention or oversight, then where does that leave humanity? There are also concerns about personal privacy. If Google Glass raised privacy hackles, drones will cause far worse problems. There have already been a few occasions where drones have caused some trouble, such as the one that crashed onto the Whitehouse lawn, or the one that overshot into a runway at London Heathrow. The point at which a drone is involved in something very serious may be the point at which their status as a mainstream toy ends. Follow Innovation Begins Here on Twitter, innovationBeginsHere,Facebook , Google+ & Linkdin.